This is, by far, one of my favorite charms that I've ever created. I even made one for myself to hang from my car's rear view mirror for a cheerful shimmer and a bit of decoration while I'm driving. 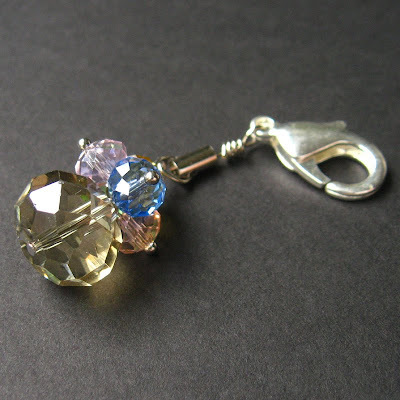 Made of colorful crystals in varying shades, smaller crystals are set in a cluster above a larger one in this handmade crystal charm that can be attached to a phone, zipper tab, key chain, purse and more. This 1-inch (2.5 cm) charm is created so that you can have your choice of attachments to suit whatever you need it for. I've made this style of charm in a number of different colors too, because once I'd made the first, I became inspired to make more.